Hurry! 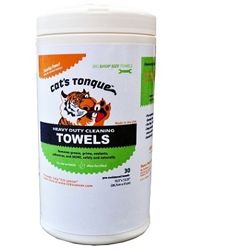 Right now you can get a FREE Cat's Tongue Heavy Duty Cleaning Towel Sample by emailing them the following information to info@catstonguetowels.com! Cat’s Tongue Heavy Duty Cleaning Towels are pre-moistened towels with unique and effective scouring power! They are made for cyclists (or frankly anyone) looking for a convenient, on-the-go solution for quickly and effectively removing grease and grime.